We are proudly announcing that our Hakkaisan Tokubetsu Junmai sake awarded GOLD AWARD in 2016 U.S. National Sake Appraisal Sake Competition. 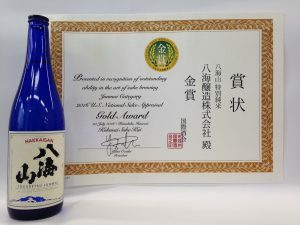 U.S. National Sake Appraisal conducts annual sake competition in Hawaii where every level of Junmai and fortification of alcohol sake which are ranked into Gold, Silver, and Bronze Awards. The Joy of Sake, a tasting event, exhibit about 400 kinds of sake which entered to the sake competition. The Joy of Sake is coming to Tokyo in November 2nd!! This is an incredible opportunity for sake lovers to try out many different sake at once and experience diversity of sake. Find Hakkaisan Sake, and let us know your thoughts! This entry was posted in Uncategorized on September 1, 2016 by hakkaiedit. Canadian, Danish, German, and South African Chamber of Commerce in Japan are going to held special charity sake tasting night.